IIT Roorkee Dean, Pramod Aggarwal announced that all the students who had been expelled owing to their poor grades have been re-enrolled in the first year and the management has decided to give them an opportunity to prove their mettle. The decision came in response to the petition raised by the expelled students to the MHRD to urge the Institute to re-consider its decision. An expelled student in his letter to the MHRD had stated that the students from the reserved categories join the institutes at relatively lower cutoffs and are expected to compete with the General Category candidates. He stated that this is a major flaw since owing to the relative grading system, they end securing low grades even after passing in all the subjects and are consequently expelled. IIT Roorkee had expelled eight students on 11th August for poor-performance days after expelling 10 students for poor grades. Surprisingly, all the 18 students belonged to the reserved category. The expulsion had prompted massive protests in the campus. It is mandatory for the B.Tech students at the IIT Roorkee to secure a CGPA of 5 or more. Students were made to sign a document which stated that CGPA of less than 5 will lead to expulsion. Students from the reserved categories are admitted on the basis of different selection parameters in the IITs. The parameters are designed in consideration of the circumstances of students from the reserved categories. Despite this provision, students from the reserved categories face difficulties in managing the curriculum in comparison to general category candidates. Consequently, MHRD requested the Institute to re-consider its decision. 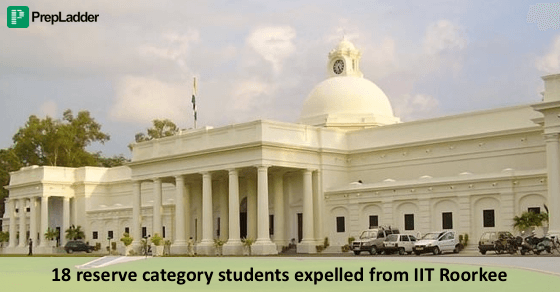 IIT Roorkee had expelled 72 students in 2015 but later readmitted them. Later on, out of the 72 candidates, 71 went on to perform well in academics.